This laser clinic is designed for intermediate-advanced racers who are looking to improve their form and technique. The laser clinic will be capped at 20 entries to ensure plenty of one-on-one attention from the coaches. BRING YOUR OWN BOAT. $200 per participant – All Ages, All Rigs welcome! Click HERE for online Clinic Registration to enroll today! 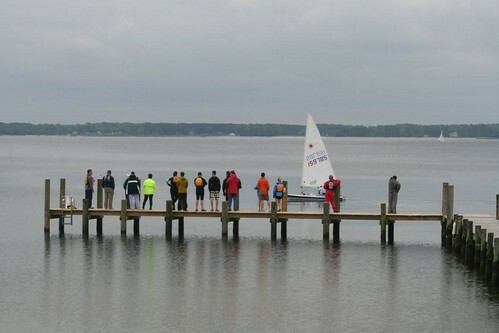 Fishing Bay Yacht club started the season by hosting a Laser clinic for a dozen sailors on a cool windless day. Mike Toms and Jon Deutsch took the sailors through the various simple, intermediate and advanced ways to rig a Laser and covered topics on the methods of dress and techniques for the various maneuvers. After a break for Lunch Jon demonstrated various aspects of boat handling while Mike narrated from the dock. After that, the boats rigged and everyone got a chance to try out a boat while drifting on Fishing Bay. While it wasn’t the best sailing day, it was a great day for sharing and learning knowledge about the Laser. 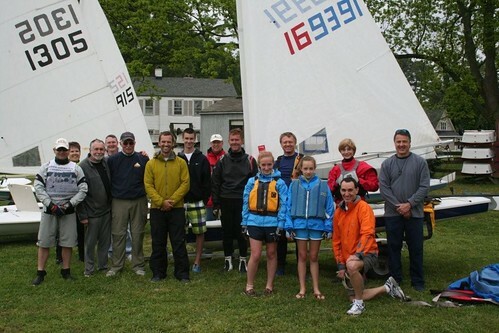 WRSC, in Galesville, MD, is offering a FREE Laser/Laser Radial Racing Clinic to all junior sailors on Friday 29 July. Kyle Swenson, WRSC’s Laser/Laser Radial coach with extensive racing experience will be running the clinic. Sailors must provide their own boat and be rigged and ready to start at 09:30. The clinic will be both on and off the water and end at 16:30. Sailors should bring a lunch and water. All sailors are invited to stay for the Friday Night Racing off the club house dock, starting at 18:00 and ending by 20:00. Contact Nan Irey by phone 301-261-9631 or email ireys@comcast.net. For additional information and to register for the clinic go to westriversc.org﻿﻿. With Hurricane Earl out of the way, we had a beautiful forecast for the weekend. On Saturday it was mid 80s with winds building from 10-15 to 15-20. Around 8:30 am sailors started rolling in to check in and rig their boats. After a quick intro the groups split off into their respective groups. 37 Lasers and Laser Radials worked together with Anna Tunnicliffe, Brad Funk, Erika Reineke, and Charles Higgins. I can honestly say that I haven’t seen so many sailors taking notes in one room. I was very impressed with the eagerness to learn and gain some valuable lessons from the coaches. 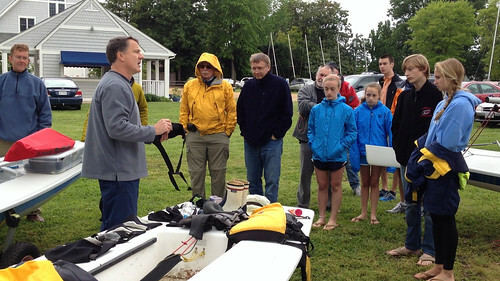 The seven Optimists worked with McLaughlin BoatWorks’ Tom Coleman, who had them out on the water pretty quickly. North Sails Cleveland loft manager Nick Turney and Kings Point’s Assistant Sailing Coach Michael Collins took the 8 high school team racers and discussed their strategy for the weekend. We also had one windsurfer working with Alessandro Ambrossi from Hampton University. eeing 52 boats out on the Elizabeth River was quite a sight; something I haven’t seen in my 7 years in the area. The coaches ran a couple drills in the morning to see the skill level of the sailors. After they had split them up into groups, the coaches worked in with their groups until lunch time. At lunch time I managed to talk to a couple of Opti sailors who were a little tentative on going out and asked them what they thought of the morning: nothing but big smiles across their faces!!! In the afternoon the wind started to increase, which meant more fun for the coaches and sailors. The coaches stepped up their drills and pushed the sailors as hard as they could. They wanted to get as much as they could out of the few hours of sailing in the afternoon. On Saturday evening, there was a BBQ and a little live music by Bekah Eden and her band. Unfortunately a lot of the sailors were really tired, so there weren’t too many people left half way through the evening; so I guess the coaches did their job. Sunday’s forecast was a little lighter than Saturday, but there was still wind. It was nice having the different conditions over the two days so the coaches could cover drills that helped the sailors in all conditions. People were a little sluggish on Sunday morning, but they were raring to go when the coaches started the talks. 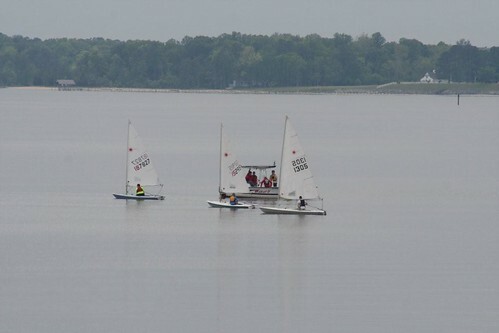 The sailors were out on the water in their groups and learning new skills and strategies. After lunch the wind died down a bit more, which didn’t stop the Optimists who were out all afternoon. It gave the Laser coaches an opportunity to talk about health, nutrition, and some fitness. After their talk, Brad led anyone who was interested in a 20 minute yoga session (yes I did get pictures!!!). After their yoga session, the sailors went out and did some fun races. They had to do a couple tacks where they ran around the front of the mast or around the back of the boom. All very funny, and sometimes painful. It was great to see everyone having a good time, and doing their best to get around the mast without falling in.